Teletronics EZMesh? 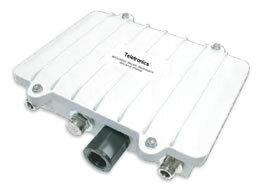 uses Mobile Mesh Technology to configurate its Wireless Access Points for outdoor multi-mode network applications. Providing City-Wide Wi-Fi access to any community large or small. The EZMesh provides users with a dependable flexible network, and at the same time improves city-wide productivity, increases safety and encourages economic development. Teletronics’ EZMesh provides Wi-Fi access using wireless mesh technology with plug-n-play easy installation, and allows wireless service providers to deliver a true wireless network over large geographical areas or other areas where wiring is too difficult or expensive to install. A Mesh Link is a true wireless connection (Point-to-multipoint, and Point-to-point) between any two EZMesh units. Teletronics EZMesh AP will automatically discover its neighboring EZMesh nodes and interconnect all the EZMesh APs together to form a large coverage wireless network. EZMesh AP implements Layer 2 mesh routing which provides excellent network performance and is fully compatible with existing network equipment and applications. The EZMesh AP is capable of supporting high-BW and low latency applications like real-time video and voice. Predictable Real-time Optimum Path (POP) routing algorithm creates a EZMesh based Wi-Fi mesh network with the highest throughput, reliable mesh link, and self-discovery/selfconfiguration/ self-healing benefits. The algorithm's human-like intelligence examines the network and makes appropriate connections among EZMesh APs in real time. It can re-establishe a new network when obstacles, individual node problems, new nodes or internet access events occur. High throughput Mesh Network is achieved by a non-blocking and no-interference design for client and backhaul traffic. The EZMesh AP multi-radio and multi-channel architecture eliminates the wireless signal interference and traffic conflict problems that exist on many other mesh network products. SNMP v2c and web-based (HTML) management interface enables both professional and non-technical users to easily handle network management and maintenance tasks for the EZMesh units. The "Point and Click" browser interface permits users to monitor node condition, link quality, traffic flow, and event logs of the EZMesh units on the mesh network. The web-based Topology function also allows Network administrators to easily configure, update, and monitor every EZMesh station on the mesh network. SNMP private MIBs are available for advanced users preferring to manage through their own network manager.